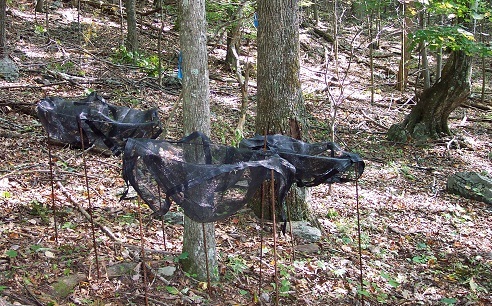 Acorn traps used for research at the Bent Creek Experimental Forest. Photo by Julia Kirschman. Some acorns go on to become the next generation of oak trees, but others are eaten by birds, bears, rodents, and deer. Rodents are in turn eaten by carnivores, and deer browsing affects which kinds of plants become established and survive. Greenberg is project leader and research ecologist at the Southern Research Station Upland Hardwood Ecology and Management unit, and lead author of a new study that forecasts acorn production for the next 50 years, both with and without oak decline. The study was recently published in the journal Forest Science. “Forest managers often target acorn production levels,” says Greenberg. “However, crop sizes are highly variable.” During mast years, acorns are plentiful, and animals feast on them. But good mast years may be followed by one or more years of small acorn crops. Acorn production varies with year, the species of oak, location, and even between individual trees, making it very challenging to predict crop size. Oak decline is adding a new layer of complexity for land managers or forest planners who want to sustain oak trees and the ecosystems that depend on them. Drought often initiates oak decline, and older trees, as well as trees growing on drier, harsher sites, are more susceptible to decline. Currently, oaks are widespread through much of the southern U.S., but many researchers and land managers worry about the future of oaks. “Oak decline is a particular concern when planning for a sustained oak component and acorn production levels because oaks don’t seem to be regenerating at the rate they are declining and finally dying,” says Greenberg. There are a number of methods for comparing acorn crops among years, locations, or species. However, many land managers want to estimate the number or volume of acorns that a particular stand or area can produce. “Though it’s impossible to predict the actual number of acorns that will be produced in a future year, we have figured out a method to estimate average acorn production over a longer period of time,” says Greenberg. Using 10 years of acorn trapping data and previously published models, Greenberg and her colleagues estimated average annual acorn production for five common oak species in the southern Appalachians. By pairing these estimates with forest inventory data from the Bent Creek Experimental Forest and factoring in the risk of oak decline, the researchers were able to forecast acorn production at the landscape level through the year 2062, both with and without oak decline, using their new ACORN function with the Forest Service modeling tool Forest Vegetation Simulator. “When oak decline is not included, the simulations suggest that by 2062, acorn production could increase by nearly 60 percent as oak trees grow,” says Greenberg. “However, when the potential for oak decline is considered, it looks like acorn production could decrease by almost 20 percent.” Neither of the simulations included management scenarios, but forest management as well as topography — moist versus dry sites — are important influences on oak species composition, abundance and size. The forecasting method lets managers tailor estimates of long-term acorn production to individual landscapes and management scenarios. Because the forecast uses forest inventory data, managers can adjust for current and future oak abundance, distribution, size growth, and mortality rates, as well as differences in how many acorns oaks of different species produce. For more information, email Cathryn Greenberg at kgreenberg@fs.fed.us.